This is less a travel book than the memoir of the author’s emotional journey. Kira Salak seems to be a professional adventurer, which is pretty cool, and she’s also a compelling storyteller, bringing to life her experience traveling around New Guinea’s swamps, rainforests, mountains, crime-ridden cities, and even a rebel refugee camp, in 1995. What she does not do quite so well is illuminate the lives of the people she meets; she’s in New Guinea to discover herself. And I get the sense she’s spent a lot of time analyzing herself, and no wonder, having received more than her share of dysfunction being raised by evangelical Objectivist parents, and feeling compelled to go off on life-threatening journeys to prove herself. But she was 24 when she took this trip and only a few years older when she wrote about it, and some of the ways she describes her emotional experiences seem a little simplistic. I also couldn’t help but shake my head at her idea that she was going to recover from the trauma of a previous kidnapping (also on a dangerous trip) by traveling through another dangerous place where, unfamiliar with the environment, she would be at the mercy of strangers. 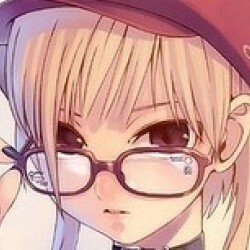 It’s no wonder this doesn’t really work for her… or it doesn’t seem to, until the epilogue, which wraps everything up rather too neatly; insisting, for instance, that she wasn’t taught to fear like other girls, when she spent most of the preceding 400 pages preoccupied with danger and fear. Her threshold for what she’s willing to do anyway is certainly higher than most women’s, but she rarely feels safe enough on this trip to enjoy herself. 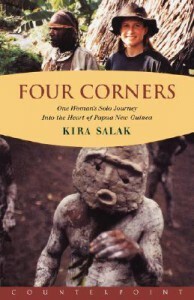 That said, Salak does write well about the places she experienced: the grueling hikes through swamps and mountains; the wonder of a helicopter ride over the jungle; the tragedy of the refugees from the western portion of New Guinea, victims of genocide from Indonesia; the hubris of missionaries trying to drag locals into a modern way of life. When she does write about locals, it’s really quite good; I loved reading about the calm swamp village where tiny children learned to paddle in tiny canoes, and she was taken in by a man who had no plates or silverware because his wife took them all when she left and moved across the road. And for that matter, about the truck drivers in Mozambique, where Salak’s early attempt at adventure got her in well over her head. But she rarely stays in one place long, and I was left wanting to learn more about these people: for instance, about the women living away from their families at the YWCA in Port Moresby, despite rampant crime there. Overall, this was enjoyable reading; it seems a bit long for what it is, but Salak has such an intense and varied journey that I’m not sure what could be cut. I think this book is worth reading, though if your primary interest in it is learning about New Guinea, you may come away frustrated.